Universal basic income. A radical rethinking of work, well-being and freedom. This is the title of the meeting that took place within the Festival of Journalism held in Perugia on April 13th, 2018. 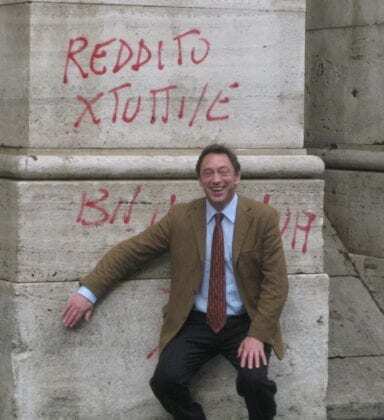 From 2 pm at the Teatro della Sapienza, Alessandro Gilioli de L’Espresso magazine interviewed Guy Standing from BIEN (Basic Income Earth Network). Can we create a fairer society by providing a guaranteed income for all citizens? What would this mean for our health, wealth and well-being? Basic income is rooted in the idea that all citizens have a role in generating the wealth currently enjoyed only by a few. Faced with the increasing precariousness in all areas of work, an emerging disaffected mass class and signals of political instability, basic income is an issue around which to build new progressive policies, to redefine citizens’ relationship with work and the community in which they live. Guy Standing, an economist who has been for many years a leading figure worldwide in research on basic income, illustrates what we can learn from the pilot projects on basic income undertaken in various parts of the world, what the effects are on the economy, on poverty and on work, and why many of the arguments against basic income can be overcome.